The minus sign shows that p decreases as r increases. Equation (4.11) is called the hydrostatic equation. Planetary rotation adds a small term to the right hand side of the equation, but we can ignore it for our purposes. where pm is the mean density of the planetary body, and R is the radius of its surface. Equation (4.12) indicates how huge the pressures are deep in the interior of a planetary body. In the case of the Earth the equation yields a value of 1.7 x 10nPa - over a million times greater than atmospheric pressure at the Earth's surface. For most substances the equation of state is not very well known at such high pressures. But we can still deduce whether a substance is a plausible ingredient. For example, molecular hydrogen (H2) and atomic helium require pressures in the Earth far in excess of 1.7 x 10nPa to become even as dense as liquid water at the Earth's surface (1000kgm-3). The same is true of atomic hydrogen. Therefore, these potentially abundant substances can account for no more than a tiny fraction of the Earth's mass. Water, at comparable pressures, is much denser than hydrogen and helium, but still well short of the Earth's mean density. Thus, neither can water, H2O, a compound of the first and third most abundant elements, account for much of the Earth's mass. Equation (4.12) also shows how much lower the interior pressures are in smaller, less dense bodies. Thus, at the centre of the Moon, equation (4.12) gives 4.7 x 109 Pa, nearly 40 times less than at the centre of the Earth. Moreover, the higher the pressure given by equation (4.12), the more this approximate equation underestimates the true pressure - by about a factor of 2 in the Earth's case (see Table 5.1). The general conclusion is that a given substance will have a markedly different density in the interiors of different planets. For comparing compositions, it is therefore useful to obtain the uncompressed mean density. Unlike the mean density it is not directly measurable, but must be calculated from equations of state, assuming a composition. Equations of state are measured in the laboratory up to pressures that fall short of those in the centres of the larger planetary bodies. For higher pressures it is necessary to do the best one can with theoretical equations or reasonable estimates. Calculate an approximate value for the pressure at the centre of Jupiter. What can you say about the pressure at shallower depths? The pressure and temperature in the interior determine whether a substance there is liquid or solid, and this is of importance to the behaviour of the interior. You have already seen this to be the case with regard to magnetic fields and the passage of seismic waves, and more examples will arise shortly. If a substance were to be a gas in the interior it would be unlikely to be retained, but would escape to the surface. We therefore need to know the ranges of pressure and temperature over which a substance will be liquid, solid, or gas. This information is provided by a phase diagram, 'phase' being a generic term for solids, liquids, and gases. Figure 4.11 shows the typical form of a phase diagram. It consists of the boundaries between the phases. If the substance is in equilibrium, and its pressure and temperature are anywhere within the area to the left of the solid + gas or solid + liquid boundaries, it will be solid. Unsurprisingly, the solid phase is confined to the lower temperatures, particularly at low pressure. 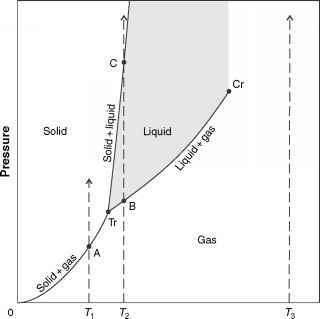 The liquid phase requires a minimum pressure and temperature, marked by point Tr in Figure 4.11. At each temperature up to Cr the gas phase can exist only up to a certain pressure. At temperatures above Cr the gas phase becomes difficult to distinguish from a liquid, hence the absence of a distinct boundary there. Tr and Cr are, respectively, the triple point and the critical point of the substance. □ What do you think is the origin of the term 'triple point'? The triple point is so named because only at this point do all three phases coexist. By contrast, on each phase boundary just two phases coexist - the phases on each side of the boundary. Numerical values have not been attached to the axes in Figure 4.11 because the pressures and temperatures of the phase boundaries vary from substance to substance. Note that the density varies across the phase diagram. The density at a specified temperature and pressure is provided by the equation of state of the substance, and so a phase diagram contains only a subset of the information encapsulated in the equation of state. It is instructive to take a substance on three imaginary journeys across the phase diagram, each one at constant temperature and starting in the gas phase. If we start at T and increase the pressure, the substance gets denser, and it then meets the phase boundary at A, where a further increase in pressure causes a huge increase in density as it solidifies. 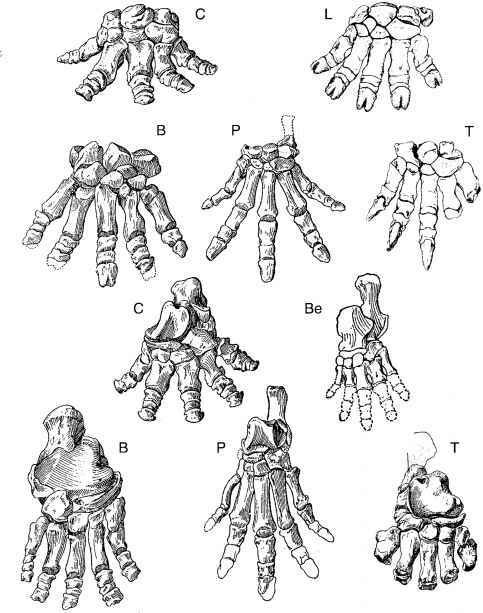 Within the solid phase there might be structural changes from one crystal form to another, which might give small density changes. If we now reverse the track the substance sublimes at A. If we start at T2, and increase the pressure, then at B the gas condenses, with a huge increase in density, and it becomes a liquid. At C there is a much smaller increase in density as the substance solidifies. Reversing the track, the substance melts at C and then vaporises at B. Finally, if we start at T3, higher than the temperature of the critical point, and increase the pressure, then the density goes on increasing to liquid-like values with no sudden changes in density such as occur across phase boundaries. Figure 4.11 The typical form of a phase diagram. For very few substances, notably water, the solid + liquid phase boundary slopes to the left, and not to the right as here. K. Water is volatile, as are all icy materials, whereas rocky materials, which include iron and other metals, are more or less refractory. Carbonaceous materials are intermediate. In later chapters you will meet phase diagrams, not only in relation to the interiors of specific bodies, but in the context of atmospheres too. Water is unusual in that the solid-liquid phase boundary slopes to the left from the triple point, and not to the right as in Figure 4.11. Describe the phase changes that occur when water in the gas phase at 273.10 K is gradually compressed at this temperature, to pressures greatly in excess of 6.1 Pa.